ww2dbaseViktor Semyonovich Abakumov was born in 1908 in Moscow, Russia as one of three children of a poor family, or at least so he claimed in a short autobiography he prepared for the Soviet NKVD in Dec 1939; a 1952 investigation failed to locate any records of his birth, and the low social status might be fabricated to distance himself fom any sign of family wealth. He claimed that he had only four years of formal schooling before volunteering for the military in 1921; 13 would be a very young age for military service, thus further supporting those who believe Abakumov was older than he claimed. As a medical orderly in the 2nd Moscow Brigade between 1921 and late 1923, he participated in the brutal suppression of the peasant uprising in Ryazan Oblast, Russia. His father passed away in 1922 during his military service. In 1924, he returned to civilian life as 2nd Moscow Special Brigade was disbanded. In the late 1920s, he joined the Communist Party via the Communist Youth League. In 1930, he was appointed the head of the Military Department of the Komsomol Zamoskvorechye Regional Office. In 1932, he joined the OGPU, which became the NKVD in 1934. As a member of the Economic Department of the NKVD, he was responsible for supervising informers that watched for foreign spies within Soviet industries. ww2dbaseAbakumov was described as tall, well-built but slightly overweight, dark brown haired, having a square face with high forehead, brown eyes, a big nose, and a big mouth with thick lips. A womanizer, he was known for having relations with some of the female informants under his responsibility. ww2dbaseOn 20 Dec 1936, Abakumov was promoted to the rank of State Security Junior Lieutenant. In Apr 1937, he was transferred to the Secret Political Department of the GUGB of the NKVD, which was a major advance in his career. Although he claimed to have very little formal education, his subordinates reported that he was an approachable superior and gave very clear and to-the-point (but very demanding) orders, while his superiors valued him for his ruthless efficiency. In 1938, he was made the acting head of the UNKVD Directorate of Rostov Oblast, Russia (his predecessor Yakov Deich was arrested in Mar 1938 and would die in prison shortly after); this appointment was made permanent on 27 Apr 1939. He was promoted to the rank of State Security Captain in Dec 1938.
ww2dbaseAbakumov remained in Rostov Oblast when the European War began in Sep 1939. During the Winter War, his directorate arrested 16 men in Rostov-on-Don, charging them of being Finnish spies. In Feb 1941, he was recalled to Moscow and was made the NKVD deputy commissar and was placed in charge of purging the Baltic States of political undesireables. In Jul 1941, he was made the head of the Special Department Directorate (UOO) in the NKVD organization with a new rank of State Security Commissar of 3rd Rank. In Feb 1943, he was promoted to the rank of State Security Commissar of the 2nd Rank. He was made the chief of the newly created Main Directorate of Counterintelligence (GUKR) SMERSH, "Death to Spies"; in this new role, his subordinates began noting that his previous approachable attitude slowly changed, ultimately shifting to a rule-by-intimidation type of management style. While he previously hunted for spies with fervor, now as the head of a counterintelligence directorate, he often personally tortured the accused to acquire confessions, usually with brutal methods. ww2dbaseAfter the war, in 1946, Abakumov was made the head of the Ministry for State Security (MGB). In Nov 1946, he established the Special Board (OSO) within the MGB, thus his ministry now gained the full range of power to arrest, investigate, judge, imprison, and carry out death sentences in Russia and Soviet-occupied nations. In 1949, he played a direct role in the "Leningrad Affair" purge. At the end of 1951, Abakumov was himself a victim of one of Joseph Stalin's purges. Arrested and brutally tortured, he was ultimately sentenced to death and executed in Dec 1954, despite the 1946 charges against him had already been found unsupported. 24 Apr 1908 Viktor Abakumov was born in Moscow, Russia. 10 Jul 1934 Viktor Abakumov was assigned to the Economic Department of the GUGB of the Soviet NKVD. 1 Aug 1934 Viktor Abakumov was assigned to GULAG department of the Soviet NKVD. 17 Aug 1935 Viktor Abakumov was assigned to the Department of Guards of the GULAG of the Soviet NKVD. 11 Nov 1936 Viktor Abakumov was assigned to the Department of Guards of Camps and Places of Imprisonment of the GULAG of the Soviet NKVD. 20 Dec 1936 Viktor Abakumov was promoted to the rank of State Security Junior Lieutenant. 15 Apr 1937 Viktor Abakumov was assigned to the 4th Department of the GUGB of the Soviet NKVD. 21 Jun 1937 Soviet official Valentin Trifonov, a former VCheKa member, was arrested and would be interrogated by members of the GUGB of the Soviet NKVD, including future Soviet counterintelligence chief Viktor Abakumov. 29 Sep 1938 Viktor Abakumov was named the assistant to the head of the 2nd Section in the 2nd Department of the GUGB of the Soviet NKVD. 1 Nov 1938 Viktor Abakumov was named the head of the 2nd Section of the 2nd Department of the GUGB of the Soviet NKVD. 5 Dec 1938 Viktor Abakumov was named acting head of the UNKVD Directorate of Rostov Oblast, Russia. 28 Dec 1938 Viktor Abakumov was promoted to the rank of State Security Captain. 27 Apr 1939 Viktor Abakumov was named the head of the UNKVD Directorate of Rostov Oblast, Russia. 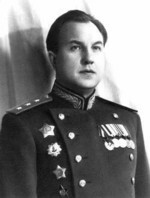 14 Mar 1940 Viktor Abakumov was promoted to the rank of State Security Major. 12 Feb 1941 Viktor Abakumov arrived at Moscow, Russia. 25 Feb 1941 Viktor Abakumov was named the NKVD deputy commissar. 17 Jul 1941 The Soviet 3rd NKO Directorate was merged back into the NKVD, becoming NKVD's Special Departments Director (UOO). Viktor Abakumov was named UOO's chief and Solomon Milshtein was named the deputy. 19 Jul 1941 Viktor Abakumov officially assumed the role as the head of UOO of the Soviet NKVD. 31 Mar 1943 The Soviet GKO meeting at 2330 hours on this date, also joined by Vsevolod Merkulov and Viktor Abakumov, discussed the establishment of a counterintelligence branch. 13 Apr 1943 The Soviet GKO meeting at 2205 hours on this date was also joined by Soviet counterintelligence leaders Vsevolod Merkulov, Viktor Abakumov, Lavrentiy Tsanava, Nikolai Selivanovsky, Nikolai Korolev, Nikolai Khannikov, Isai Babich, Nikolai Mel'nikov, Filipp Golikov, and Aleksandr Shcherbakov. Most of them would leave at 2330 hours, leaving Joseph Stalin, Lavrentiy Beria, Vyacheslav Molotov, and Georgy Malenkov to continue the discussion on reorganization of Soviet counterintelligence efforts. 15 Apr 1943 Viktor Abakumov was summoned to meet with Joseph Stalin. 18 Apr 1943 Viktor Abakumov was summoned to meet with Joseph Stalin. 19 Apr 1943 Viktor Abakumov was named the head of the newly formed Soviet Main Directorate of Counterintelligence (GUKR) SMERSH; he reported directly to Joseph Stalin. 28 Apr 1943 Viktor Abakumov personally arrested Major General Boris Teplinsky, the head of the Operational Department of the Air Force of the Siberian Military District on false charges of treason, conspiracy, and spreading anti-Soviet propaganda. 29 Apr 1943 Viktor Abakumov was summoned to Joseph Stalin's office to consider GUKR SMERSH deputies; at the same meeting, Abakumov was named the deputy commissar of the NKO, reporting directly to Stalin. 4 Mar 1944 Viktor Abakumov was awarded the Order of Suvorov 2nd Class. 2 Nov 1944 Viktor Abakumov reported to Lavrentiy that up to 1 Nov 1944 his SMERSH personnel in Poland had arrested 499 persons, 82 of whom were already transferred to the Soviet Union while the remaining were detained at the Bialystok city prison in Poland. 8 Nov 1944 Viktor Abakumov and Lavrentiy Tsanava reported to Lavrentiy Beria that 1,200 Polish Home Army and other partisan troops were captured in Poland by this date. 1,030 of them were sent to the NKVD-run Ostashkov Special Camp in Tver Oblast, Russia by a special train on the previous day. 22 Nov 1944 Viktor Abakumov reported to Lavrentiy Beria that by 15 Nov 1944 59 Romanian-German intelligence personnel, 546 Romanian intelligence personnel, 180 German intelligence personnel, and 9 Hungarian intelligence personnel were arrested by SMERSH in Romania. 21 Apr 1945 Viktor Abakumov was awarded the Order of Kutuzov 1st Class for the successful execution of the radio game "Tuman" involving Pyotr Tavrin, a Russian national who spied for the Germans. 22 Apr 1945 Viktor Abakumov personally participated in the arrest of Aleksandr Nobikov, who failed to promote Joseph Stalin's son, Vasilii Stalin, to general rank. 15 May 1945 Viktor Abakumov appointed Isai Babich and Aleksandr Misyurev to head the SMERSH units attached to the Far Eastern Group of Soviet Troops. 22 May 1945 Viktor Abakumov complained to Lavrentiy Beria of NKVD official Ivan Serov's interference with the SMERSH investigation of Adolf Hitler's final days. 22 Jun 1945 Viktor Abakumov wrote to Lavrentiy Beria complaining of Ivan Serov's interference with Soviet SMERSH business. Beria, with Joseph Stalin's approval, instead made Serov the plenipotentiary of all Soviet counterintelligence in Germany, thus expanding NKVD's control over SMERSH in the occupied country. Abakumov refused to allow his subordinates to follow Serov's command, however, thus Serov's authority would only be nominal. 19 Jul 1945 Viktor Abakumov was promoted to the rank of colonel general. 25 Sep 1945 Viktor Abakumov ordered the curtailment of looting by Soviet troops in Germany. 6 May 1946 Viktor Abakumov submitted the names of Sergei Ogoltsov, Nikolai Selivanovsky, Afanasii Blinov, Nikolai Kovalchuk, and Mikhail Svinelupov as candidates to be his deputies at the Soviet Ministry for State Security (MGB). 7 May 1946 Soviet Politburo named Viktor Abakumov the head of the Soviet Ministry for State Security (MGB). 10 May 1946 The Soviet counterintelligence agency SMERSH merged with the MGB; Viktor Abakumov was made the head of this larger organization. 12 Jul 1951 Viktor Abakumov, Nikolai Selivanovsky, Mikhail Likhachev, Mikhail Belkin, and Georgiy Utekhin were arrested as ordered by Joseph Stalin. 12 Dec 1954 The trial against Viktor Abakumov began in Leningrad, Russia for his association with Lavrentiy Beria. 19 Dec 1954 Viktor Abakumov was executed in Leningrad, Russia.